On December the 4th 2009, I filed to have my name placed on the ballot for United States Representative District 24 in the upcoming Republican Primary. This was done after my wife and I met with the Tarrant County Chairman, Stephanie Klick. We ask for Ms. Klick's advice. We did not ask for anyone's support. During the discussion, Ms. Klick mentioned the policy was not to support any Candidate in the primary. Apparently, I upset someone's apple cart. As on December 5th, I received a phone call from someone identifying himself as Harold Rumzek, the Tarrant County Republican Precinct Chair & Area Leader for Texas House District 98. After his introduction, the first thing he said was "you do not know what you are getting yourself into. No one gets elected unless he (meaning the Precinct Chair) approves the candidate. We are happy with our team in Washington." He said he knew everyone in politics and especially Kenny Marchant and he will always support Kenny. He demanded my credentials as he was going to be the one to get my information out. I told him for brevity sake, simply go to a website under construction. The website would give him a rough overview of my portfolio. I ask him for his input on the site. I suggested we meet and discuss the situation and he agreed to meet Monday, December 13, 2009. He stated term limits were a very bad idea and I was too green in politics to know better. Term limits are in the state Republican Party platform. Later Mr. Rumzek sent me a four (4) page very insulting, condescending email. I have never met the man and he is not my Precinct Chairman. I will not apologize for anything that I have done. Voluntarily, I will share our thoughts. My wife is a Super Intelligent Certified Public Accountant who runs her own business and a small farm. Being pretty has an advantage. We both love politics and have grave concerns for the Country we love. She wants to get more involved in the political process as she reduces her work schedule. She thought more involvement in the Republican Party would be the way to go. We both like to meet people of mutual interest. I said it would be too frustrating because of the way the party operates. I cannot stand status quo. She said "well why don't you run for office against Kenny Marchant since you have never thought much of his job performance." I said that is not a bad idea as I am starting to feel guilty for being a member of the silent majority. If I could get a chance to have a small voice, maybe I could make a contribution. I had been evaluating my opponent Kenny Marchant since District 24 was made for him. I am convinced anyone could do as well or better at the job than Kenny. I will bring my management skills to play as the Representative for District 24. There is not a shadow of doubt in my mind, my performance will be substantially better than Mr. Marchant. At 10:00 P.M. on December the 3rd, I told my wife I am going for it and I am looking forward to the challenge of the race and meeting new people. I have always excelled being the underdog as I am always underestimated. Looking to describe one of my work habit traits, I ask one of my friends if he thought I had the tenacity of a bull dog. He replied, "no a pit bull." I cannot walk on water but my feet are clean and no one pulls my chain except my wife. I am a bottom line business man who believes in Conservative values. I believe in Contingency Management Style, out of the box thinking, being ahead of the game, and leading my competitor rather than joining the pack. In my business dealings with employees and other relationships, my first approach is a verbal exchange of ideas . The second approach becomes a little stronger exchange with more emphasis. The third approach is a verbal hammer which basically results in a one way conversation where I am talking and they are listening. If that does not work, I end the relationship. I am tired of expressing my suggestions to the State and National Republican Party and getting a form letter response of thanks for your letter. Please send money! The process of putting my name on the ballot is about the third approach method. It was a surprise to find there is evidence of a hard nose Republican Hierarchy, who wants to keep a power base, intimidate and restrict Constitutional Rights, Freedom of Speech and Liberty for a citizen trying to run for political office. The Constitution specifies the requirements to be a Candidate for office of U.S. Representative and I meet those requirements! I don't have to explain anything to anyone! It does not make sense to me to fund and sponsor a congress person like Kenny Marchant who votes as told, does very little work but gets a lot of credit and personal benefit. It is a bad deal from a return on investment perspective. Since Kenny serves on the Nation's financial committees, one would assume he is privileged to current National financial information. He works in residential housing and dealing with finance. If he was working and digging into the Nations finances and paying attention to the sub prime lending in residential housing, maybe he could have given his colleagues in Washington a heads up on the financial crises before it happened. A heads up may have saved the Republicans from getting caught with their pants down and losing an election. It is even more inconceivable for Republican bosses from Tarrant County to support Mr. Marchant when any effort he expends is directed to Dallas County. If not for the Tarrant County vote, he would have been beaten in the last election. If by some astronomical chance I were elected Representative of District 24, the District will be equally treated. I have lived in each Dallas and Tarrant County and can serve both equally. It seems Mr. Marchant's name is only known by the high rankers. People like Michael Burgess and Gary Fickes are needed representing the party. People like Kenny who jump on the bandwagon after it starts down the road and promotes their self image on the sweat of others is not needed. I am sure Mr. Marchant is a nice guy, good family man and smooth talker. He appears to stay under the voters' radar by never sticking his neck out from the pack. He never makes a wave. It is easy to do that when you perform to the minimum. For a long time I have been trying to get suggestions of fix across to the Republican heads. I have used various methods. I even designed a new logo and made lapel pins. I sent a letter and pin sample to numerous party officials. The response, thank you and please send money. Send us your money and we will decide its effective use. Sounds like President Obama's approach. When a team is not winning and they bring in a new coach and the new coach is any good, he evaluates his talent, starts with the basics and makes sure that all team members are excellent performers in the basics. Simple plays are designed and the team practices to the point of excellence in execution. Then maybe a few trick plays are installed. A poor coach would start with cutesy trick plays and lose. An uninformed 5th grader looks at The National Republican cutesy logo. The question is asked. "What does this logo represent?" The odds are great he would not say the Republican Party. The logo used by the National Republican Party is Emblematic of its cutesy approach in politics. Look at the simplistic identification of a diet coke bottle. 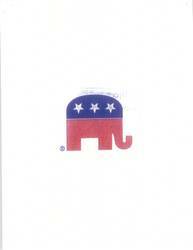 To illustrate my point I designed a Republican logo and made a lapel pin. The Elephant stands for intelligence and strength. 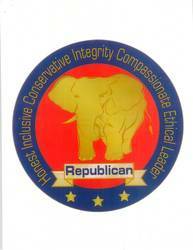 Honest*Inclusive*Conservative*Integrity*Compassion*Ethical*Leader should be part of the Republican standard. My message to the Republican Party is get back to the basics of conservatism and stop being cutesy. Develop your principles, goals and message in a simple and direct way so that it is easy for a fifth grader to understand! If people of our experience, talents and where with all have to buck some kind of political union shop seniority system in the Republican Party, we will find some other way to fulfill our interest. We have nothing to lose in our two month quest and everything to gain. Meeting new people who love their Country makes this plan a winner for us. We are bringing in new people who have never participated in the political process and that is great!